Termites in particular, subterranean termites are the most damaging insects of wood and can cause significant property damage. Their presence can be very difficult to detect in advance and typically their destructive damage is done before they are seen. They are small, ant-like insects that differ from ants in that they feed off of wood. Termites are social insects that live in colonies underground in the soil and where their labor is divided among a caste system. Soldier – These termites protect the colony and comprise of only 1 – 3% of the colony population. 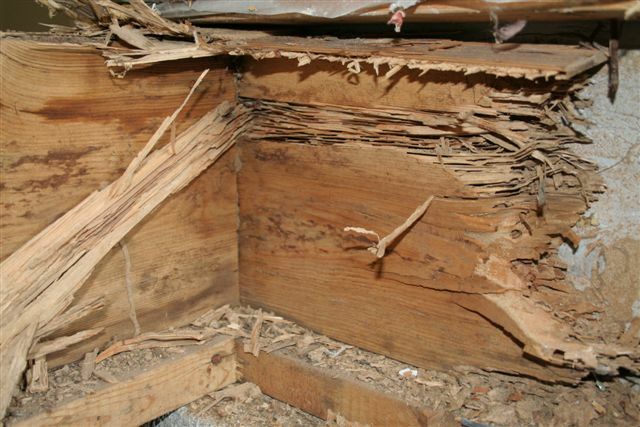 Workers – These termites cause the most damage by eating wood and building tunnels. Workers also maintain the colony by building and repairing the nest, seeking out for food sources. Workers are the most numerous of a colony population. Reproductive – The queen or king of a colony, which remains underground and can, live up to 10 years, producing thousands of termites. Reproductive termites can either be primary or secondary. Primary reproductive termites have flown out of a colony to start a new colony and secondary reproductive termites serve as replacements if something happens to the primary reproductive termite. They cause an estimated $5 billion in property damages and repair costs annually. More than 4 million homes in the United States are at risk of infestation every year. The Pest Guys, a division of TurfGator offers two termite control options, liquid termite treatments and termite bait stations. Both pest control services are very effective in protecting your home that you and your family have worked so hard for. Termites are small, ant-like insects that cause significant property damage to homes and building structures every year. Their presence can be difficult to detect and typically their destructive damage is done before they are seen. Preventative and curative pest control solutions such as a liquid treatments or bait stations are the best options in protecting your home and in giving you peace of mind. It is always a good idea to consult with a pest control professional and ask any questions you may have. Look around, ask friends or family, and research companies on the Better Business Bureau to find a company that you can trust. It seems that as we move into summer, the tick population is growing. With the population growing, the risk of contracting a tick-carried disease increases. There are many different types of ticks. Some may carry certain diseases and some may carry nothing. Knowing the types of ticks, how to remove a tick, and what to do if you have any suspicions are key factors in protecting yourself and your pets from their blood sucking bite. 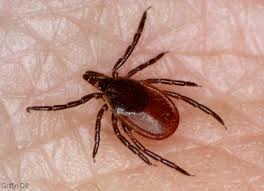 One of the most common types of ticks throughout Illinois includes the Black-legged Tick, also known as the Deer tick. Deer ticks like to lurk in knee-high brush and shrubbery. The female deer tick prefers to attack larger hosts, like deer, but are commonly seen latched onto humans and pets. The male deer tick does not feed on hosts like the female does. This is a blood-orange colored tick with black legs and could possibly carry Lyme disease. Another tick that may be seen in our area is the American Dog Tick, found east of the Rocky Mountains but more dominant on the east coast. This tick likes dogs as its host, but will also feed on cattle and other larger animals. This reddish-brown tick has grey or silver markings on its back that looks like a shield. This tick has been known to carry vectors that contribute to Rocky Mountain spotted fever. The Brown Dog Tick is located across the entire United States. This tick is brownish-red in color but has a hexagon shaped body, opposed to a more rounded body of the other ticks. It prefers to feed on dogs, but will feed on a wide variety of mammals. Similar to the American Dog Tick, the Brown Dog Tick has been known to contribute to Rocky Mountain spotted fever. The Lone Star Tick is easily distinguished by the lone white dot (or star) on its back for females, and several spots or streaks on the back of males. The Lone Star Tick is not known to carry Lyme disease, but can cause STARI or Southern Tick Associated Rash Illness in its hosts of dogs, cattle, deer, and humans. A tick should be removed with fine tipped tweezers. The tick should be grasped as close to the hosts skin surface as possible. Grasp the tick firmly and pull upward in a fluent motion. Twisting or jerking the tick too quickly could detach the head from the body, rather than removing the entire tick. If a rash, infection, or illness occurs within a couple weeks of removing a tick your doctor should be contacted for continued treatment. Be sure to inform the doctor that there was a tick bite, where it was, and where the tick most likely got picked up from. 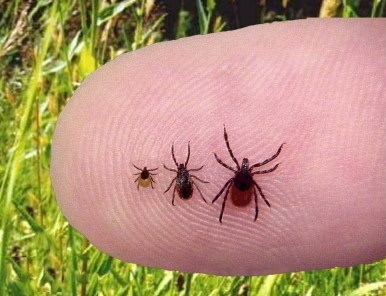 Most ticks are only active between the months of April and September; unfortunately it is during this time that many people venture out to the woods or their favorite fishing hole. During this time it is recommended to avoid areas such as woods, fields, and trails. The brush, tall grass, and shade allow for the perfect area for ticks to be lurking and waiting to attach on to a host for their next meal. When going into areas that would be prone to ticks, the proper preventative measures should be followed, as well as a thorough body search to see if you attracted any of the little bugs. Using insect repellents that contain 20%-30% DEET can greatly help, all exposed skin & clothing should be sprayed every few hours as directed by the product label. Light colored clothing has been said to be less of an attractant than dark colored clothing. All gear, clothing, people, and pets should be washed and checked immediately, especially the scalp and crevices such as behind the knees and in the arm pits. Clothing should be put into the dryer on a high heat setting for one hour to kill any ticks embedded within it. Ticks are not restricted to wooded or bushy areas; they can be within the lawn or landscaping as well. Many pet owners treat their pets with monthly flea and tick medicine, but do not consider treating the lawn and landscaping. Monthly pet medicine is good at prevent ticks from biting, but does not necessarily prevent them from hoping on the pet for free ride into the house, where it can attach to humans or untreated indoor pets. A nuisance pest control is an excellent service that kills all fleas and ticks, as well as over 180 different species of insects such as spiders, ants, roaches within the lawn. Nuisance Pest Control is a pesticide service that is done 3 times per year and each application has a residual of 45 to 60 days depending on the weather conditions. These services have had such great success that many pet owners are able to stop applying monthly medicines to their pets and rely solely on the total lawn pest control. The blood sucking bite of tick should be taken seriously and proper preventative measures should be used to control the presence around you. If bitten, take a look at the ticks that are removed and try to identify which ones they are, clean the area, and keep a watch for any symptoms of tick carried illnesses. It is always a good idea to consult with a lawn care professional and ask any questions you may have. Look around, ask friends or family, and research companies on the Better Business Bureau to find a company that you can trust. 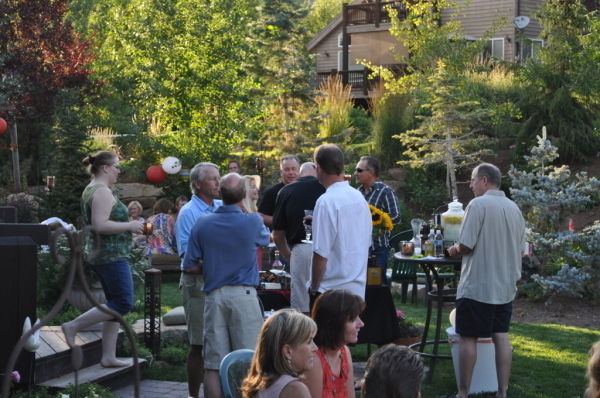 Having an outdoor party or get together? Want to keep uninvited pests away? Are citronella candles and repelling torches not working? Tired of spraying filmy and odor ridden bug sprays on yourself and your family that do not work? Tired of your outdoor events being ruined because of insects? Keeping pest away from outdoor parties is easy with Mosquito Control. Mosquito control is a broad spectrum insecticide application that will keep pests away. This application is conducted as a onetime spray before the big event. This particular application will typically last for one week, but depending on weather conditions could last a full month. The outdoor party pest control is different from the other pest control solutions offered because it is mixed at a higher rate to allow for a greater defense against mosquitoes and other flying insects. When Should Mosquito Control be applied? Mosquito control should be applied a day or two before the outdoor event. A technician will be dispatched to spray everything within the property including the lawn, concrete surfaces, landscaping and any other area within the party area. This application will take roughly 2 hours to dry, at which point it would be safe for pets, children, and guests can travel onto the lawn. Save your invited guests from uninvited pests. Being bitten by mosquitoes or swatting off other insects can be controlled with a mosquito control application. They go unnoticed until the damage is done and the itching begins. Mosquitoes are one of the most complained about insects and rightly so due to the diseases they cause. Throughout the world, over 3500 different species of mosquitoes have been discovered and each has their own qualities. Some mosquitoes are blood suckers while others are not. Some mosquitoes bite indoors while others prefer to bite in wooded areas. A mosquito has different ways to find its prey through heat, visual, or chemical sensors. Many thrive with nectar and plant juices but the female needs blood to produce eggs. Besides the painful itch left behind after being targeted by mosquitoes, disease can be spread. Viral diseases, such as yellow fever, can be transferred from human to human as well as parasitic diseases such as malaria and West Nile virus. The number one way to prevent mosquitoes is to remove any standing water, this is a breeding ground for mosquitoes as that is the ideal spot for the females to lay eggs. Natural predators such as dragonflies eat the larvae and help to reduce the mosquito population as well as using trapping, insecticides, netting, and screens to protect against the population and control future infestations. Mosquitoes are quite the nuisance and can cause serious illnesses. Be sure to eliminate conditions that are prone to mosquito populating, use insecticides for the current mosquito population, as well as mosquito netting and window screens to prevent mosquitoes from intruding on you and your home. Every year pests become a problem as they try to enter homes across the area. Ants, spiders, and more are trying to stay out of the cold winters, out of the spring rains, and are in search of water during drought conditions. Pest control around homes can keep over 180 different species of insects away from the perimeter of a home. At The Pest Guys we offer this service with our Perimeter Pest Control applications. What is Perimeter Pest Control? Perimeter pest control is an insecticide application that is sprayed around the perimeter outside of the home. This application acts as a barrier that not only kills any pests present while spraying, but also repels insects from traveling within the area that has been sprayed. This application has a residual of 30-60 days depending on the weather; during very rainy periods it may not last as long, while dry conditions allow for a longer period of protection. When Should Perimeter Pest Control be applied? When it comes to perimeter pest control, like most pest control applications, timing is critical. It is beneficial to spray the area before the pests become a problem inside the home. It is a lot easier to prevent an infestation than it is to treat after the fact. It is also important to keep perimeter pest control constant. Following the proper application schedule each year will help make the home look less appealing to the insects. Typically the proper schedule includes a spring application, a summer application, a late summer application, and a fall application. To sum it up, perimeter pest control applications not only treat for insects that are trying to get into your home, but also to prevent future invasions from pests. Following a schedule each year will help with your fight to keep these bugs out of your home. Every year, many dogs, cats and other household pets will have problems with fleas and ticks and many barbecues are ruined by ants and other insects. Pest control in lawns is achievable with our Nuisance Pest Control insecticide application which will keep these nuisances at bay and allow for a more enjoyable use of your lawn. What is Nuisance Pest Control? Nuisance pest control is an insecticide application that is used to kill pests that are present at the time of treatment but also to repel insects from venturing into the lawn. A nuisance pest control application can treat for and repel up 180 different species of lawn insects including ants, spiders, roaches, fleas and ticks. While this application is not necessarily marketed towards flying insects such as mosquitoes, flies, or gnats, it has proven to be successful at repelling them when the proper treatment schedule is followed each year. When should a nuisance pest control application be applied? A nuisance pest control application should be applied before pests become a problem, and should be done several times each year to prolong the treatment and prevention of insects. These applications are typically conducted in spring, summers, and late summer or early fall. Following the proper application process each year will not only treat for insects within the lawn, but may also prevent future infestations. Pest control in lawns will keep your yard pests free and allow for more enjoyment for your family and pest, as well as for guests when hosting barbecues or pool parties. Anyone who has pets can tell you that fleas and ticks are a major concern, not only for the health of the pet but also the health of the owners. Fleas and ticks cause discomfort as well as the possibility of spreading diseases not only for animals, but also for humans. What are Fleas and Ticks? Fleas are external parasites that latch onto their host and thrive on their blood. Fleas are wingless and jump from area to area from host to host. Fleas are dark in color and very small with a hard outer body that can withstand great pressure. A female flea can produce up to 5000 or more eggs over the course of a lifetime, which is typically 3 months up to a year and a half when conditions are ideal. Ticks are also external parasites that feed on the blood of their host. These pests are light weight with 8 legs and are usually not noticed until after they have bitten. It is very difficult to feel a tick walking on the skin, and typically it will not walk but simply latch on where it lands. The tick produces saliva that it secretes into the bite area to prevent blood from clotting and allow for an easier feed. Fleas can cause substantial damage to pets and property. An infestation of fleas that goes untreated can cause severe pain from chewing and scratching on pets caused by flea allergic dermatitis, meaning allergic to the flea bite, humans can also feel the pain from this allergy and may experience red blotches similar to mosquito bites. Due to the blood sucking nature of fleas, death can occur as well, especially in older pets that may not groom themselves as well or suffer from other illnesses. A flea infestation that gets out of control may result in property damage as well. If the population cannot be tamed, furniture and carpets may need torn out and be replaced. Ticks can also cause damage with their bites. The difference is that ticks latch onto one spot and typically stay in that spot and bite deeper into the skin. Ticks can carry a wide variety of diseases such as Lyme disease, Rocky Mountain spotted fever, and many others. If a tick is noticed, it is critical to get it off as soon as possible and critical that the entire tick is removed. If part of the tick is left behind it can cause severe infection. To prevent fleas and ticks, treatments are created to be applied monthly to the animal to kill and repel these parasites. Pest control applications can be sprayed on the lawn by lawn care companies to kill any invaders present and prevent future pests. When traveling into wooded areas, bug sprays and bug repellents are recommended to help prevent contracting these parasites. After walking through heavily wooded areas, it is recommended to check all over the body and throughout the hair to see if there are any ticks present and remove them immediately with tweezers or seek medical attention. Fleas and ticks are parasites that can cause serious problems for those they come into contact with. Preventative care with lawn applications and monthly pet medicines are the first defense against the aggravation, pain, and illness associated with fleas and ticks. Called The pest guy because I moved into new house and seen a lot of spiders. Vince came out sprayed inside and outside of my home. He took his time and explained everything to me. I’m very pleased with their service and will continue using them. I have had extreme customer service with this company! They were quick to respond to my email as well get out to mine and my sisters property to take care of our problem. Very pleased! They also gave me a referral credit for telling my sister! The Pest Guys is my go to! Thank you! Having The Pest Guys come treat our new home was the right call! Vince was very professional and took the time to listen to the problem with bugs that we were having. I would highly recommend The Pest Guys! Great service, always on time and great with customers. Sean is great!